Or, rather, down the "tube" -- singular. Yes, the Curmudgeon is starting his Friday morning with a weak play on words -- "tube" being British slang for what Americans would call the subway. I found out about this new service the other day, on my way home, when my wife was able to get through to me on my cellphone even though I was on the train, far underground. If the bars on the phone mean anything, I had better reception there than I usually do here in my Undisclosed Location well above street level in Downtown Chicago. Another zone of privacy has been removed. It's not that I spend my evenings carousing in night clubs before returning to the warmth of home and hearth. At my age and state of health I lack the intestinal fortitude -- indeed, I lack the intestines! -- for such goings on. But there have been evenings where I have told Long Suffering Spouse I'd be leaving soon... and then the office phone rings... or I get involved in a project... or I can't overcome the inertia to actually get out of my office chair... and an hour or more sneaks by unnoticed. I know, on such occasions, that my wife will eventually call my cell phone: Where are you? she will ask... and I will feel bad because dinner is cold and she is tired and I have failed to do as I promised to do. Maybe we were supposed to be somewhere at 7:00 or 7:30... and there is now only a theoretical chance that we will be on time. Until this week, I knew, in such instances (these are rare, I would assert, though I haven't asked Long Suffering Spouse for confirmation on this point) that, once I descended through the sidewalk at Lake and Wells, I was passing beyond reach of any immediate cellular accusation: You didn't leave when you said you would. By the time my phone might receive a signal again, I would have legitimately made substantial progress toward home and could realistically forecast being home in 10 minutes time. Or 15. And then, of course, as news of this innovation spreads... probably by cellphone... more and more train passengers will while away their commutes by talking on their darned phones. And in the subway one must frequently SHOUT to be heard over the squealing noises made by the train. Perhaps they will shout their own excuses about why they failed to leave when they said they would. Perhaps I will take notes. I hadn't heard from my blogfriend MJ (the proprietor of Nurse Ratched's Place) in some time -- which is not surprising because I haven't heard from a lot of blogfriends in some time. Then again, I have been sadly neglectful in my blog visiting duties and there is a clear correlation. Older Daughter told me about the extraordinary security involved with the test. She had to surrender her smart phone of course -- otherwise she might have been able to find an app to outsource the taking of the test to India or something. She was photographed and finger-printed and, she said, under video surveillance during the entire process. And there were no blue books! Maybe you have to be as old as I am to remember what a blue book is -- a little booklet of blank paper in which exam answers would be written. Her test was taken entirely on a computer. Older Daughter was a wreck in the weeks leading up to the exam. There'd been a snafu about getting permission to test in Indiana (she graduated from an Illinois nursing school). Thus, there was far too long an interval between her review course (in early January) and Tuesday. Older Daughter had been reading and studying and taking practice tests on line and driving herself... and the rest of us... nuts. She was so turned around by the weekend before the test she probably wasn't sure which end of the syringe gets stuck in a patient's tush. Fortunately for Long Suffering Spouse and myself, Older Daughter and her husband live in Indianapolis. So my daughter was largely her husband's problem. His Facebook postings showed increasing desperation as the test day approached. Older Daughter's mother-in-law is a nurse. She offered to help Older Daughter study. No stress there, right? Older Daughter had started out passing every practice exam. But, as the Big Day approached, and she began second-guessing herself, her scores began to plummet. After she hadn't passed a practice exam in a week or more she began talking about postponing the test. That's when I put my foot down. If you have to retake it, you have to retake it, I told her -- but take the darn thing first. I heard from Older Daughter as she left the exam site Tuesday. "I didn't think it was possible to flunk in only 75 questions," she told me. "But I failed. I'm sure of it." "Wait a minute," I responded. "You told me that 22 of your classmates have already taken the exam and all 22 thought they flunked when they came out." "And only two actually failed, right?" "And one of them -- you told me -- it was all for the best that she did fail, right?" "And didn't you tell me that if the test shuts off after 75 questions, it's only because you've passed?" "That's before I took it. It was awful...."
I let her go on in this vein for awhile. It's what fathers are expected to do. When she finally paused to take a breath, or choke back a sob, I jumped in: "You passed." "No! I didn't! I know it!" "We'll see," I said, and somehow I managed to steer the conversation around to when actual results might become available. She told me that she could pay an extra fee and get results Thursday morning. That would be today. So, to me, having to wait only two days for results was nothing short of a miracle of modern technology. I said so. And, of course, Older Daughter disagreed. Two days was an eternity. Especially because the computer already knew when it shut the test down whether she had passed or whether she had set a new world's record for earliest failure. She was determined to find out before the two whole days passed. "Well?" I asked after Older Daughter explained what she was doing. "Well, maybe I passed," she said, reluctantly, I thought. She told me what she'd done to reach this conclusion; I don't want to reveal any secrets so I won't repeat them. It wasn't nearly as messy, though, as poking around sheep guts. "That's great!" I said. "Congratulations!" Still, Older Daughter was not satisfied. There has to be some way, she told me, to find out for certain. There was a grim determination in her tone. By yesterday morning, Older Daughter and her husband had found a back way into the test results; they even knew Older Daughter's brand-new license number. And it was on Facebook before dinnertime. For the modern generation, this is how anything becomes official. Still, there was another question to be answered: Should she pay the extra fee for "early" disclosure of the test results this morning? I said she should because she needed the printout in order to apply for jobs. (No, she doesn't have a job yet.) But I haven't heard yet whether my advice was once again ignored. I assume so, however. Long Suffering Spouse was thrilled to hear that Older Daughter passed. She'd been ready to strangle Older Daughter, too, in the days before the exam. But, in her jubilation, Long Suffering Spouse issued me a warning: "You better be nice to her," she told me, "she'll be the one called in to take care of you now." For more about Older Daughter's nursing school graduation, read this post. 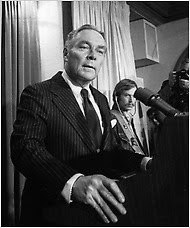 This photo of Alexander M. Haig, Jr., Ronald Reagan's first Secretary of State (obtained from this New York Times -- genuflection optional -- obituary), was taken on the very day that Haig's reputation suffered fatal damage. It was March 30, 1981, and Ronald Reagan had been shot. Maybe Regan was joking with his doctors ("I hope you're all Republicans") or trying to allay his wife's fears with a quip ("Honey, I forgot to duck") -- but American Presidents had, until that point, a notoriously bad record of surviving gunshot wounds. At a White House press conference, Haig told the world, "I am in control here." It was a statement that has been the first thing recalled in every reminiscence of the man that I have seen. Reagan's Vice President, Bush the Elder, was out of town at the time of the shooting. Haig said he was in control until the Vice President returned. As a matter of law, Haig was dead wrong, of course. The line of presidential succession runs from the Vice President to the Speaker of the House to the President pro tempore of the Senate before it reaches the Secretary of State -- but Haig wasn't talking to constitutional law professors. He was speaking to the world -- and, in particular, those in the world who might see the assassination attempt as an opportunity for mischief. If he had used a more collegial "we" he might eventually have been elected president in his own right. Instead, his 1988 campaign folded before the New Hampshire primary. The NYT obituary notes that Haig was effectively POTUS in the last days of the Nixon Administration. There is no doubt that Haig eased Nixon out in August 1974. The obituary recounts that Haig discussed the possibility of a pardon for Nixon with Gerald Ford on August 1, 1974. Although the Times doesn't mention it, I recall that Haig -- a career military officer, rising to Vice Chief of Staff of the Army before being called back to the White House as Nixon's Chief of Staff -- also passed word to the Army during those frightening days that any White House requests for military assistance of any sort would need to come strictly through the chain of command. I don't know that a coup was in the offing in August 1974. I doubt Nixon could have mustered the will to try. But there was probably a danger of some ambitious person making a play and using Nixon for that purpose. Actually, if Haig were deserving of the scorn heaped upon him in 1981 for his "I am in control" comments, it's a wonder that he didn't try and take over in 1974. Funeral arrangements for General Haig are pending. A Mass is being planned at Fort Myers and interment at Arlington National Cemetery but both must wait a couple of weeks, according to Haig's brother Frank, a Jesuit priest, "due to the wars in Afghanistan and Iraq." Update, February 24: For a diametrically opposing viewpoint, read Christopher Hitchens' February 22 post on Slate.com, a column that was reproduced in this morning's Chicago Sun-Times (where I read it). In his column, Hitchens writes of Haig, "His manically authoritarian personality frightened even many on the right, from John Poindexter to Richard Allen, and his career was one of contempt for democracy at home and abroad. From his squalid life one can learn to detect the diseased symptoms of Caesarism and the urgency of combating it." Who says bloggers never consider both sides of a question? Of course, Hitchens' analysis is locked into 1981... and my impressions were formed in 1974. One of us may be wrong -- or, since we are talking about the same man but looking at him at two different times in his life, we may both have a point. This is why history is interesting, don't you think? Heads or Tails #128 -- "rumor"
Gosh, it's Tuesday again already and our mysterious meme-mistress Barb challenges us to write about "rumor" in today's Heads or Tails. That doesn't mean we have to spread rumors, though I suppose that might be seen as tempting for an anonymous blogger like myself. But, truth be told, I don't care much for rumors. Usually. Unfounded rumors can do a lot of unnecessary damage. I suppose all of us can recall a time when we were ourselves victims of a rumor -- nasty whisperings -- sidelong glances -- people avoiding us. Maybe you can recall a situation where someone has tried to pour some verbal poison in your ear -- someone tried telling you something you knew to be false. I hope you squelched that rumor right there. But there are places in this world where "rumor" is the only way real news can spread. People passing along what they've heard, person to person, in person, or (now) by text or tweet. Iran comes to mind. Or any place where there is no free press that can ferret out true facts and report them. Sadly, in modern America, where our press is surely free to report what it wants to, I begin to suspect, more and more, that the press fails to report on things of real interest to people -- and rumors crop up in the vacuum. This is one of the reasons why I am so attracted to blogging: Many times blogs report on things of interest to me that the press ignores. Bloggers may not be trained journalists (though some are), but many seem to have more regard for the truth than some of the members of the Fourth Estate. The problem, as in so many things, is figuring out which is which. Yet another reason why the Curmudgeon doesn't "tweet"
Once hailed as "first in war, first in peace and first in the hearts of his countrymen," Washington has been demoted as part of our national zeal to have as many three day weekends as possible. Once Washington's Birthday was a recognized holiday... now we have "Presidents Day" where Washington must share the spotlight with the likes of Warren G. Harding, James Buchanan, Millard Fillmore, or Chester A. Arthur. If George Washington had been like other men there might still be a United States of America. It would be a monarchy, of course, or at least it would have been until a second American Revolution. George Washington could have made himself King and the country would have accepted it. Many in the country would have cheered the news. In 1783, when Washington resigned from his military command and voluntarily entered retirement, the world was shocked. His recent foe, King George III, said of Washington's retirement, "If he does that, he will be the greatest man in the world." Washington, like so many of his contemporaries, was steeped in the classics. He and his brother officers knew well the tale of Lucius Quinctius Cincinnatus, who was twice called from retirement to become Dictator of Rome. Cincinnatus left his plow in the field when the Senate came to ask his aid in rescuing the Republic. He attended to the threat and promptly gave up his office -- returning, as legend has it, to the plow, still waiting for him in the field where he had left it. You can look up Cincinnatus and find that he wasn't entirely admirable, by our standards: His political career was devoted to the suppression of the ambitions of Rome's plebeian class. If you're having trouble remembering what plebeians are, let me help you: You and I are almost certainly plebeians. I certainly was not born into the nobility. George Washington's voluntary relinquishment of the presidency after two terms -- though he surely could have had a third if he'd wished it -- set a precedent that remained inviolate until Franklin D. Roosevelt ran for a third term in 1940. The two term limit was later written into the Constitution by the 22nd Amendment in 1947. And the most important precedent he set was stepping aside. "I had rather be on my farm than be emperor of the world," he said -- just like Cincinnatus. Washington said these things -- just as so many other, lesser mortals in so many other countries have said similar things since. But Washington followed through. His attitude, thankfully, became embedded in the American psyche. Supposedly Sarah Palin became flummoxed recently when asked, in a Fox TV interview, which of the Founding Fathers was her favorite. According to the story I read, she eventually stammered out, "All of them?" Of course, it was a trick question. The first response must be -- must always be -- "Do you mean who's my favorite... other than George Washington?" 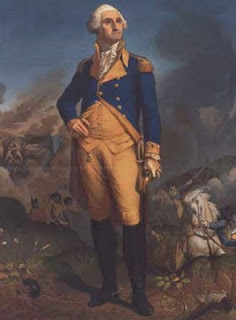 And today is Washington's Birthday: He was born on February 11, 1732. Before you start looking at your calendar, remember that, when George was born, the British Empire had yet to adopt the Gregorian calendar. (It finally did so in 1752 -- and, by then, to catch up with everyone else, 11 days had to be added on to the current date. Many people thought 11 days had been stolen from their lives -- though Wikipedia disputes this.) Anyway, Washington's Birthday became February 22. 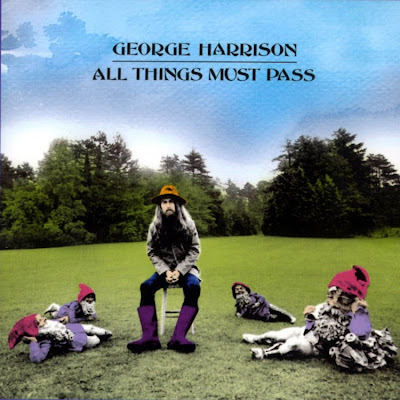 Happy Birthday, George. This year it's Oldest Son's turn to marry. He, too, will marry out of town and we'll have to scramble to accommodate the date. Youngest Son will have to rearrange his final exams. But that's alright; this is the way things work. Oldest Son and his bride won't be able to "tap" my friends and relations for gifts because almost no one from my side of the family will go. I gave him a minimal invitation list, just enough to be proper, and warned him that, even from this small group, only a few will come. But Long Suffering Spouse does want to throw him and his bride a shower (technically, it's his sisters who be the hostesses... but you know what that means) and we've been bandying dates about lately, trying to see what might work for the young couple. We finally found a date. So I asked Oldest Son for a list of people -- his friends, his fiancee's friends -- that we should invite. He doesn't want to invite any of them. And he said so. Nicely... but still rather bluntly, too. I understand that showers are not a lot of fun. My wife's mother threw a very traditional (read: women-only) shower before Long Suffering Spouse and I were wed. The event was at the very large home of a friend of my future mother-in-law's and there were little triangular sandwiches with the crusts cut off and some orange goo in them and all the other traditional fixings. I was one of those fixings: The groom is trotted out, but only at the end of the 'traditional' shower, like the prize bull, to be pinched and petted and fussed over. Anyway, Long Suffering Spouse and I have since been involved in many "couples' showers" -- this worked particularly well as our friends paired off -- and some of these turned into enjoyable parties. It was this sort of event that Long Suffering Spouse had in mind for Oldest Son and his bride. But they are not cooperating. When Oldest Son sent me the non-list list, I duly reported it to my wife. And then I ducked. She got after me immediately to write to Oldest Son's fiancee -- she and I are Facebook 'friends' you see, so I have a means of reaching out to her that bypasses my son -- and I did so immediately. I may be dumb, but I'm not stupid. But I knew how it would all work out... badly. Oldest Son is marrying a girl just like himself. These may be the most independent pair of humans ever to join forces. Oldest Son was ready to move out from the family home in about 7th grade. He delayed his actual departure until a week or two after his college graduation, but he absented himself from the center of the family at every opportunity during the intervening years. It's not that he is alienated from us, or angry with us. He's been a dutiful son. And very correct. But he is not... shall we say... warm and fuzzy. He never was. And today, when I speak to Long Suffering Spouse at lunchtime, I'll have to tell her about our future daughter-in-law's very correct -- and not at all helpful -- response to my plea. And then I'll have to duck again. The AP reports today that Pakistan now confirms what news outlets have been telling us about all week, namely, that the Taliban's reputed no. 2 commander, Mullah Abdul Ghani Baradar, has been arrested. This is being touted as a splendid victory. I don't know if you've had the same perception, but it seems to me that Americans and their allies are always rounding up the no. 2 figure in the Taliban or in al-Qaeda. We just never seem to find Mullah Omar or Osama bin Laden. Getting promoted to no. 2 in these terrorist groups seems to be career suicide, while being no. 1 means never having to say, "I surrender." Of course, some cynics may suspect that counterterrorism experts are full of no. 2 themselves -- that they habitually exaggerate the value of their captures. This might have been possible in a past administration, I suppose, but we now live in the enlightened and transparent Age of Obama where such things would never be permitted. Right? So, perhaps, another explanation is required. Maybe it has to do with the terrorist business model. I remember when banks had nearly as many vice presidents as employees. Nearly everyone promoted past teller was a VP or at least an assistant vice president or assistant secretary. It had something to do with the execution of corporate and trust documents. Title companies were similarly loaded with gaudy titles. Perhaps the Taliban and al-Qaeda pass out titles with a similar liberality. If so, it would be the first and only liberal thing that either group has ever done. But then it would not be our counterterrorism experts who are exaggerating the value of our captives, it would be the captives themselves, each proclaiming himself a VP -- a no. 2. Which brings us to our second recent splendid victory in the war on terror: This past Friday the Transportation Safety Administration finally apologized to the parents of a four year-old, developmentally delayed boy, who was forced to remove his corrective leg braces before being allowed to board a flight to Disney World -- last March. Little Ryan Thomas had not been reported as a potential terrorist threat by his father -- something that would distinguish Ryan's case from that of, say, Umar Farouk Abdulmutallab. Indeed, Ryan's father, Bob, a Camden, New Jersey police officer, was trying to board the same flight. According to the linked AP story, TSA spokesperson Ann Davis acknowledges that "there are other ways to screen people with leg braces." I've objected to the concept of "Homeland Security" from the start. "Homeland" sounds dangerously close, to my ear, to "Fatherland." Look: America is a place, like Germany or Sweeden or Fiji -- but it has always been something more, too. It is an idea, or a set of ideas -- of beliefs -- in freedom of thought, freedom of expression, freedom of religion, freedom of movement. New York or Washington could disappear tomorrow -- but America would not be dead or even crippled -- unless our wounds were self-inflicted. Our embrace of principles over bloodlines has allowed us to become the freest, most open, and most inclusive society in the history of the world. That's American exceptionalism. Letting petty tyrants rip the leg braces off a little boy -- without cause or justification -- allowing them to pour out coffee cups and make people take off their shoes in the name of "security" -- diminishes us all. Ben Franklin said it long, long ago: "Those who would give up essential liberty to purchase a little temporary safety deserve neither liberty nor safety." Yes, there are bad guys in the world (almost all no. 2's in their respective terrorist organizations, apparently) but we can watch out for them without turning ourselves into a nation of stocking-footed sheep. For more on Ryan Thomas' airport nightmare, read this column by Daniel Rubin. In Chicago, in February, it's dark when we get up in the morning; it's dark when we come home from work. The Sun continues to rise and set, because even Richard M. Daley's Chicago, seemingly exempt from so many other laws, is not exempt from the Laws of Nature -- but we in Chicago do not see the Sun during February, except in brief glimpses. The Sun is generally hidden by a thick layer of gloomy clouds. The Christmas lights that brightened our spirits just a couple of months ago are all gone now -- not taken down, perhaps, but no longer lit. There were Valentine's decorations -- a red heart here or there -- but these had minimal effect. Light is something that comes from a headlight, or a streetlight, or from the TV set, tuned to any channel that offers escape. There's snow on the ground but the temperature is starting to creep up a bit during the day. Some solar radiation penetrates the clouds. With the heat and friction from passing cars and pedestrians, just enough snow melts to turn all the ice and snow to shades from dingy gray to coal black. Lent is appropriately timed in Chicago, at least this year. Tomorrow is Ash Wednesday -- the beginning of 40 days of penitence and fasting. And, regardless of whether you believe in any other Reward, our earthly reward for these sacrifices will be April -- when we will see light again, even on the trips to and from work. It is better, we're told, to light one candle than to curse the darkness. And always remember, you do not make your own candle shine brighter by blowing out the other fellow's. But T.S. 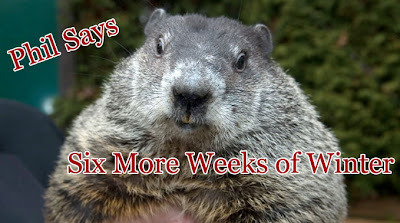 Eliot didn't know what he was talking about: February, not April, is the cruelest month. We read constantly these days how the newspaper business is in decline. The newspapers have been getting thinner for some time. Now broadsheets are physically shrinking, too. The Chicago Tribune's "broadsheet pages are an inch narrower, its tab pages an inch shallower." The news hole is smaller. There are even fewer comics. Only the newsstand price has increased. Less for more: It's the way it is in modern America. Today is Lincoln's Birthday and state and county offices are closed here in Illinois. Before Lincoln became President, he was one of the busiest lawyers in Illinois. For many years, Lincoln held the record for most appearances in the Illinois Supreme Court. He may still; I haven't looked it up this morning. Once, Lincoln appeared before the Supreme Court twice in the same day, in two different cases -- on different sides of the same issue. In other words, the position he was arguing for in the first case was the position he was arguing against in the second. One of the learned justices asked, "Surely, Mr. Lincoln, you don't expect to win both these cases?" "No," said Mr. Lincoln, "but I fully expect to win one of 'em." But, though Illinois honors Lincoln, and celebrates his birthday, we can't boast that he was born here. Abe was born in Kentucky and grew up in Indiana. So this morning, I'm thinking of someone who really is a favorite son of Illinois, namely, the Waukegan Wonder, Benjamin Kubelsky, born on Valentine's Day in 1894 -- just 90 years before my Older Daughter, if you're looking for an additional hook here. Benny Kubelsky changed his name on the road to fame and fortune -- and, as Jack Benny, became a comedian famous for not telling jokes. In fact, most of his biggest laughs came from him not saying anything. And yet, somehow, he became a national star on radio. I found a couple of video clips for this morning's tribute. The first shows Benny with a very young Johnny Carson -- in which Carson presumes to give Benny advice. Of course, Carson kept doing a Benny imitation -- and he'd be the first to admit it -- throughout his long career. All those hangdog double takes were pure Benny. In our second clip, Benny and longtime friend Mel Blanc guest on The Tonight Show. The YouTube site from which I pilfered this clip says that this appearance was in April 1974 -- only a few months before Benny's death. Wikipedia claims that Benny's last Tonight Show appearance was in 1972, on Carson's 10th Anniversary Special. I don't really care which is accurate; I just love to see Benny again, and I hope you do, too. If Jack were alive today, he'd be looking forward to his 39th birthday. And Older Daughter? Well, she's thinking about drawing a line in the sand, too. Happy Birthday to you both. But it is seemingly at the center of all family arguments. It's occurred to me of late that the office is where I go to make money... and home is where I go to watch it spent. This is unfair, of course, on a couple of levels. First, to cite just one example, I owe West a lot of money already -- they sent me a fax yesterday in case I'd forgotten about them (they're so considerate that way) -- and my business checking account is running on fumes just like my personal account. Second, the reason we work is so that we can spend money on things like food and shelter and education for the children. Right now I'm trying to figure out how to come up with enough cash for a haircut. Most people who work have a pretty fair idea of what they'll bring home in any given pay period. Even folks who work on commission -- though their income fluctuates, there is a correlation between how much they sell and how much they earn. In my profession, however, my hardest work can produce the least rewards -- and this is even though I bill by the hour, as opposed to the win-or-else contingent fee system. Thus, I don't know from month to month what to expect or even what to hope for. We got 12.6 inches of snow officially yesterday at O'Hare Airport, just a few miles from where I live (where we got at least that much). That's a new February one-day snowfall record in Chicago. In Baltimore, given what's been going on there of late, they'd consider 12.6 inches a reprieve. Or, at worst, a minor inconvenience. The storm that brushed Chicago (we got lake effect snow, meaning that winds from the back end of the storm came down Lake Michigan to give us our accumulation) has headed off toward Baltimore and Philadelphia and Washington today. These areas may get twice as much as we did. When it reaches the Eastern Seaboard, the cloud structure of the storm, according to one radio report I heard, will resemble a hurricane as much as anything else. Still, it's an ill-wind that blows no good: Congress can't meet with all the snow coming down and it will be going straight into a Presidents' Day recess. That's a couple more days that they can do no mischief, at least. I was a smart-aleck yesterday, doubting our weather prognosticators who'd been promising 8 to 12 inches of the white stuff. I said the over-under in Vegas was only three inches -- and that I was taking the under. I was reminded of this every time I shoveled yesterday. Long Suffering Spouse was really hoping for a snow day today. But her school did not close. Even with the earthquake this morning. Yes, we allegedly had a magnitude 3.8 earthquake at about 4:00am. You can't prove it by me. The opening of Youngest Son's school was delayed for two hours this morning. (I just called to wake him up.) But that was the only compromise that we made with our normal routines, despite Mother Nature's record-setting efforts. There's one pile of snow adjacent to our driveway that's about four feet tall. That's going to last awhile... even if we don't get the next snowstorm that may or may not be heading this way this weekend (opinion is divided). As much as a foot of snow is predicted in Chicago between today and tonight -- not much, perhaps, by comparison to what they've gone through a couple of times this winter in the District of Columbia, Northern Virginia, etc. -- but bad enough. We don't usually get big snows in February here. In my lifetime, the truly memorable snow events have been in January. 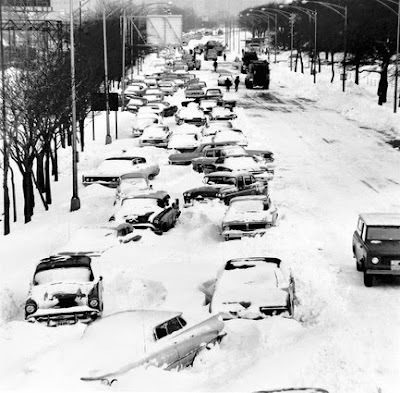 There was the Blizzard of '67, of course (see above) and the one in '79. We had a pretty good snow on Valentine's Day in 1990, when 8-12 inches of snow fell. I remember walking home from the train that night along the frontage road of the Kennedy Expressway. What I remember most was the silence. No cars were moving below. A lot of plans got canceled that night. Long Suffering Spouse, though, is hoping that the weather prognosticators have badly underestimated the strength of today's storm. She could do, she tells me, with a snow day. Imagine: A teacher who longs for a snow day. Wouldn't you have thought that impossible when you were a kid? When I was a kid I longed for snow days. (I got a couple of them, too, in 1967.) 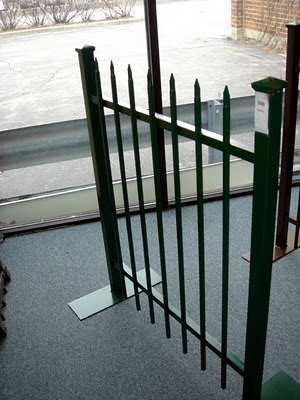 In high school I longed to get trapped at school. But, unlike my children, I went to a co-ed public high school. There's no romance in big snowfalls for grownups... not unless its so big that the world shuts down for a spell. And, even then, we'd have to dig out eventually. Mostly a snow like this is just big enough to be unpleasant -- and not big enough to provide an excuse for staying home. There's one factor that might help make this snow a truly big event: Long Suffering Spouse and I have doctors' appointments this afternoon in the suburbs. The Universe may punish me for my bad attitude. Others may suffer along with me. In this morning's Heads or Tails, we are bound, per the directive of our meme-mistress Barb, to write about "chain." Chains: The ties that really bind? I've been working on the chain gang? Chain-chain-chain, chain of fools? You are no doubt familiar -- if you don't live in Chicago, at least -- with the chain link fence. 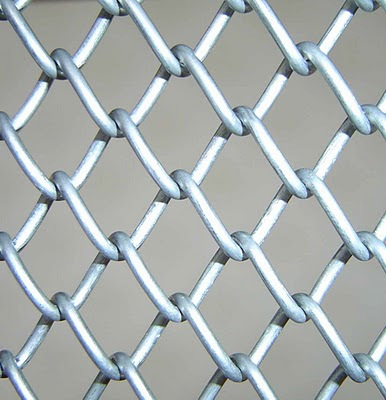 This photo, stolen, er, lifted from the Internet, is a rather artistic rendering of the weave of the chain link fence. There is a certain zen-like beauty, as well as comfort in the repetition of the shape, and in the interlocking of the pieces. From the pattern, we learn strength in unity and cooperation. No new construction, no rehab job, no building of any kind, public or private, seems to go up in the City of Chicago these days without some length of wrought iron fencing. 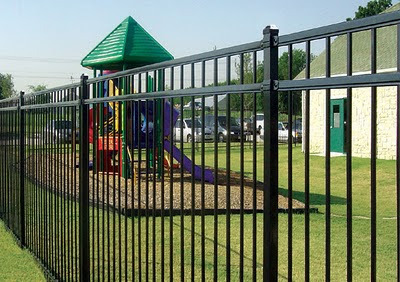 When our parish built a new parish center, the City decreed that the parking area would be surrounded by wrought iron. Chain link fencing would not do. If you're not the contemplative type, wrought iron may be considered more aesthetically pleasing. It certainly costs more than chain link fencing. If I were the cynical type -- which, of course, I am not, I might think that this municipal enthusiasm for wrought iron had to do with some well-placed political type's having a relative in the wrought iron fencing business. Someday, when the history of Chicago at the turn of the 21st Century is written, such a connection might be found. But, for now, I, in my innocence, see no connection whatsoever. Just don't plan to pull a permit for construction in Chicago without budgeting for wrought iron. Oldest and Middle Sons had talked about taking their brother out for wings until Long Suffering Spouse advised that she'd laid in some Italian Beef in case they decided to come for dinner. That disclosure decided them, all right; all that needed deciding then was when they would arrive. Youngest Son had been weightlifting with the football team first thing Saturday morning; he went comatose on the den couch after snarfing down some bacon and scrambled eggs upon his return. When the incessant beeping of his cell phone was able to penetrate his sleeping consciousness, he discovered that a lot of the kids from the baseball team would be out playing laser tag that evening. He wished to join them. Youngest Son's actual birthday was yesterday, not Saturday, but he'd already informed us that he wouldn't be available then: A major league strength and conditioning coach was coming over to school Sunday morning to offer pointers to the baseball players. And we -- his very mean and heartless parents -- are requiring him to take an ACT review course on Sunday afternoons. Thus, there would be only a small window of opportunity in which to acknowledge our youngest's natal day; it would have to be done early Saturday evening. Oldest Son was the first to arrive. He actually took the train this time and walked from the station. He informed us that Middle Son had gone home after work (he's working every Saturday during tax season) to take a nap. There soon arose some question about whether Middle Son would return to a waking state before Youngest Son went off to shoot lasers at his baseball teammates. Since food was involved, Middle Son found the strength to join us in a timely manner. Meanwhile, Long Suffering Spouse, as-ever prepared for any eventuality, had a cake already made. She was decorating it while calling her mother to come over and join the impromptu celebration. So the Rockwell-esque tableau in the living room of the Curmudgeon home early Saturday evening: I and my three boys on one side of the room, my spouse and her mother on the other. When Middle Son ate a salad his mother prepared, Long Suffering Spouse and Abuela clucked appreciatively. When the boys' conversation descended into the mean-spirited or tasteless, Long Suffering Spouse would deflect Abuela's attention. Food was consumed in large quantities. The cake was produced with the requisite number of candles -- most of them of the trick variety, meaning that they spark and reignite when one attempts to blow them out in the usual manner. This gave Youngest Son's brothers all sorts of opportunity to give him grief about his inadequate conditioning. Long Suffering Spouse gave Oldest Son a cup of water in which to douse the trick candles. But Youngest Son, determined to triumph over the stubborn candles, kept blowing them out... and 're-blowing'... and 're-blowing.' One candle in particular was particularly stubborn. I asked Long Suffering Spouse to take note of the location of that candle on the cake and to please not give me a piece cut from anywhere near that candle. Later, Oldest Son picked up a newspaper from the coffee table. He feigned shock. He looked at the paper again, then pulled out his elaborate cell phone (a Raspberry or Beri-Beri or something like that) and looked at that... then back at the paper. "Wow," he said finally, after he made sure I was watching his elaborate pantomime. "I knew they put the Internet on the phone" -- here he held up the phone screen and scrolled down to show me -- "but I didn't know they put the Internet on paper too." It was at this point that I plaintively asked Long Suffering Spouse why she had to give me smart-aleck sons. Top 10 funniest Super Bowl commercials? A couple caught my particular attention. The compiler of this list seemed to think that this commercial might have aired in 1999. Not so. If you look close you'll see the copyright date is 2000. I've always felt that this commercial never got sufficient credit (or blame) for bursting the dot.com bubble -- which, as the linked Wikipedia article will tell you, occurred in March 2000, only about 40 days after this commercial aired. Also a standout on the linked list is this parody of the Tom Hanks movie Cast Away. If you remember the movie at all, this one will make you laugh out loud. Although, yes, this is rather mean, too. What's the funniest Super Bowl commercial you can remember? And... do you think any commercial tomorrow evening will make someone's future funniest list? How's that for a flat, straight-from-the-mountaintop assertion to start off your Friday morning? Of course, as devoted readers of Second Effort, you necessarily expect I will cite some new survey or publication that makes my point. Oldest Son and Middle Son have always had a complicated relationship. I believe Oldest Son genuinely cares for his brother -- somewhere, deep in the core of his being -- but, like John D. Rockefeller, Sr. supposedly did with his own kids, Oldest Son tries to cheat his younger brother at every turn. When they were little -- as in 6 and not-quite-4 little -- Oldest Son would play baseball with his brother in the street outside our house. There weren't enough kids for full teams... or anything close thereto... but there were usually four or five kids including Oldest Son's friend Tommy, who lived down the block, who were usually available. One day only Oldest Son, Tommy, and Middle Son were available to play. Long Suffering Spouse still talks about how, after a couple of hours, Middle Son came back into the house, crying his eyes out. He'd "lost" -- 100 to nothing, he said, or maybe 1,000 to nothing. "What were the teams?" asked Long Suffering Spouse. Well, snuffled Middle Son, he played alone -- against his brother and Tommy. Fast forward to the present. Oldest Son is getting married in a few months, now, and Tommy will be standing up. So will Middle Son. Oldest Son doesn't fill us in on every particular of his wedding planning. He reveals data sporadically -- just as he always has -- and you'd best be prepared to receive everything he has to say when he decides to say it... because he won't repeat it. Long Suffering Spouse tries her best to pry information from him but it's tough. For one thing, she'd like to know the colors of the bridesmaids' dresses. I don't know why this is so important -- but I understand women do think it of vital import. It may be that he's not told us because there is some indecision on the part of his bride; at least we've heard a number of color schemes in the past several months, some of them absurd. Eventually, I imagine, we'll find out. We found out about tuxes the other night: Oldest Son had called me a couple of weeks ago to ask if I'd be willing to wear a tux. (Even in traditional weddings, as far as I know, the father of the groom, as a true supernumerary, has no particular sartorial obligations... except not to embarrass his spouse.) I said I would if that's what he wanted me to do -- and he called the other night to tell me that I would wear a tux, that the tux will be black, with a vest, that I can be fitted at a chain store here in Chicago, and that he will pick up all the tuxes in San Antonio (where the nuptials are to take place). Fine, I said, that's one less thing to take on the plane. Later that same evening, just after Long Suffering Spouse and I had retired for the evening, Youngest Son came bounding into our room. He was holding his cell phone. Middle Son had called him (hoping we weren't asleep, but by calling his brother, avoiding the chance of startling us awake if we were asleep). 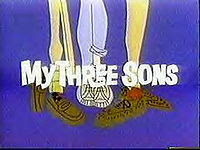 Youngest Son told us Middle Son was on the phone and he had just learned about the tuxes and he was upset. "Mom, Dad," Youngest Son repeated (although we could hear Middle Son quite plainly; he must have been shouting), "did you know the tuxedos will be pink?" Oldest Son had gotten his brother again. Another generation will pass away -- at least -- before more Americans walk where Buzz Aldrin once briefly trod. That's the intended consequence of President Obama's proposed cuts in NASA's budget. According to Joel Achenbach's February 1 article in the Washington Post, "the administration effectively plans to kill the Constellation program that called for a return to the moon by 2020. The budget, expected to increase slightly over the current $18.7 billion, is also a death knell for the Ares 1 rocket, NASA's planned successor to the space shuttle." Budget proposals are sometimes overridden: In a recession Congress gets mighty testy about cutting back programs that will cost jobs in the districts of powerful members. That's the response focused on by the AP's Jay Reeves in this article, from today's Chicago Tribune. Stopping development on Ares not only means losing jobs in the near future; it means that the billions that NASA has already spent on the project were wasted. The Washington Post says that the Obama budget "will call for spending $6 billion over five years to develop a commercial spacecraft that could taxi astronauts into low Earth orbit. Going commercial with a human crew would represent a dramatic change in the way NASA does business. Instead of NASA owning the spacecraft and overseeing every nut and bolt of its design and construction, a private company would design and build the spacecraft with NASA looking over its shoulder." In this vision, NASA would evolve into an FAA and/or an NTSB for rocketships. As visions go, this is a pretty good one. But... is it overly optimistic on the basis of today's technology? That depends, apparently, on whether you're a candidate for the proposed "seed money" that the Feds may sprinkle over aspiring aerospace contractors. Former NASA administrator Michael Griffin is quoted in Achenbach's article as saying, "One day it will be like commercial airline travel, just not yet.... It's like 1920. Lindbergh hasn't flown the Atlantic, and they're trying to sell 747s to Pan Am." Griffin is opposed to abandoning NASA's return to the moon. But, Achenbach writes, "John Gedmark, executive director of the Commercial Spaceflight Federation, said the critics underestimate the maturity of the commercial sector." But Mr. Gedmark represents the folks who would be the beneficiaries of federal largesse. My own opinion is that we're still in the Lewis and Clark stage of spaceflight: Right now, we are trudging through the wilderness, looking but not staying. When we set up permanent installations, like frontier forts, in orbit and beyond, commercial enterprises will scramble to set up trading posts... and tourism... and manufacturing.... The Russians are already bringing the occasional tourist to the International Space Station. But America had better wake up to the fact that if we don't claim the high ground of outer space, others will. And we may not be real pleased with who we see up on the hills when we wake up one morning. Yesterday's flight was apparently sub-orbital (the capsule containing the small animal passengers was allegedly returned safely to Earth). But if Iran can put a satellite into orbit, it can also put a warhead on the surface. Anywhere on the surface. America was very careful, in the Cold War era, not to goad the Soviets into militarizing outer space. Our astronauts generally were career military officers -- but we were careful to stress the civilian control of NASA and our peaceful intentions in reaching for the stars. The Soviets may have been unpleasant, but they weren't crazy: They knew we could militarize space if they did, so they didn't either. 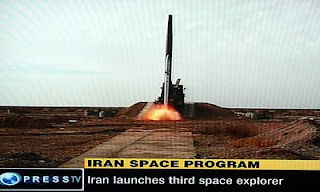 Meanwhile, in Iran, President Mahmoud Ahmadinejad launches satellites and tries to build nuclear weapons. And he's crazy as a loon. The Soviets -- as logical atheists who didn't believe in a next world -- were understandably chary about blowing up this one. Ahmadinejad, though, has a well-known "penchant for Shia eschatology," repeatedly claiming "to be personally guided by the Mahdi, the prophesised messiah of Islam." (Quotes from this essay, posted on Al Jazeera.) The Mahdi is the 12th, or "Hidden" Imam, who, though born in 868 A.D., is still living and will return at the End of Days (with Jesus, by the way) to establish justice in the world. Do you think Mahmoud Ahmadinejad will show any restraint... if gets the opportunity... about militarizing space? We don't have to launch orbital nuclear platforms to stop Ahmadinejad. We don't need lasers or bombs. We just have to be there first. We have to hold the high ground. The fellow on the left voted in an election last year in Lebanon (source). 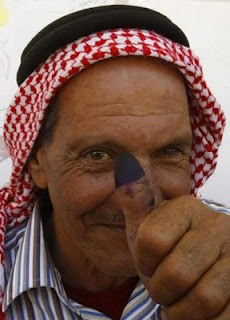 In several countries it is the practice to mark ballot applications with a thumbprint; this can cut down on electoral fraud -- and provide conclusive proof of who voted in any given election. In parts of some countries in the Middle East -- Afghanistan, most recently -- being caught with an ink-stained thumb can constitute grounds for summary execution. What we so politely call 'insurgents' or 'extremists' here in the West don't merely boycott elections; they kill people who don't. Can you imagine having to take your life in your hands for the opportunity to influence, in the smallest of ways, the future of your country? We had a primary yesterday in Illinois. Most people (roughly three out of four) stayed home. People were turned off by negative attack ads, pundits theorized. It snowed a little, too, others noted. The primary is too early (it used to be in March). People are squeamish about having to declare a party when you get to the polls (in Illinois, in the primary, one must ask for a Democratic, Republican or Green Party ballot). What would this man -- or the men and women who risked life and limb to vote in Afghanistan or Iraq -- think of such flimsy excuses? What would the men and women who were actually beaten or killed for having the courage to vote think of this? People in Illinois who could have voted yesterday but who did not should be embarrassed and ashamed of themselves. A woman came up to Benjamin Franklin as he was leaving a closing session of the Constitutional Convention. "Well, Doctor," she asked him, "what have we got -- a Republic or a Monarchy?" Franklin replied, "A Republic, if you can keep it." On mornings like this, I can't help but wonder a little if we still can. So many, in such God-forsaken parts of the world, would sacrifice anything for the American Dream. And 75% of our registered voters can't even be bothered to vote. I hadn't posted here since January 22? My goodness. Perhaps I really could quit if I wanted to. Truth to tell, I've been swamped with a project that I didn't want to start for a client who's recently stopped paying. That's a combination that's guaranteed to increase my inertia. For obvious reasons, I will not go into too much detail, but the bottom line is that we are expected to efile here in the Northern District of Illinois -- and by Friday afternoon, the deadline for filing the motion, I was looking at an enormous pile of paper exhibits that would have to be turned into .pdf (Adobe) documents and thereafter sliced and diced so no set of exhibits exceeded 2MB in file size. I called opposing counsel and told the truth: Writing the motion was easy. Scanning the exhibits would be impossible... at least for me... not if I started on Friday afternoon. He agreed to extend my time to file until Monday. And Sunday morning, into the office I came, firing up the scanner and converting away. By late Sunday afternoon, I was drooping again. It wasn't hard work, and no heavy lifting was involved. But it was dull, boring and repetitious and my eyes were hurting and I still wasn't ready to upload the files into the court's system. To make a long story even longer, it was around this time that I noticed the redaction requirement. Rule 5.2 of the Federal Rules of Civil Procedure requires that certain personal information be redacted before filing. This is not really a silly rule. I mean, in the bad old days, before privacy, we'd file medical records, social security numbers, all sorts of personal stuff, as exhibits to pleadings or discovery responses. But those materials could be accessed only at the counter in the courthouse by someone who asked to look at the paper court file. In the modern age, anyone (or at least anyone who signs up for a PACER account) can look at any federal case anywhere in the country and even search by names for interesting things to look at. Anyway, my case involves a struggle among corporations and LLCs -- not people. But I was not out of the woods. Corporations have employees. And employees give depositions. And in their depositions the witnesses are typically asked to give their birth dates -- something that must be redacted under F.R.C.P. 5.2. And when the little box came up that asked if I'd redacted and cited the rule and I looked it up.... Aaaarrrrgghhhhh! I had to pull out five pages from a pile of nearly a thousand. Five pages on which birth dates were listed. I tried to figure out a way to redact within Adobe Acrobat 7.0 -- but, after awhile, I had to give the job up as hopeless. I went back to my trusty paper copies, made new copies, struck through the offending birth dates with magic marker, scanned the new pages and substituted the new pages into each exhibit. Then I went back in and uploaded again. I did eventually make it home. There was an email, though, Monday morning from the Clerk. Anyway, I'm back -- sort of -- until the next project becomes overwhelming. But that shouldn't be for at least another week. Or so. In this morning's Heads or Tails, we write about anything we want -- so long as we make it a list of three things. Barb says these can be from any category we want. Well, I haven't participated for a couple of weeks so I'm probably overdoing here... but I'll choose three things from totally random categories. If anyone wants, you can leave a comment about how the three things should be linked together. Three things from random categories. OK, maybe this one isn't totally "random." I wanted something for item three that had to do with threes... and I thought of the Roman Triumverates... and then I tried to think of which of these would be the least known in the modern age. That's how I picked Marcus Aemilius Lepidus. I mean, everyone knows Julius Caesar and his elderly son-in-law and eventual opponent, Gnaeus Pompeius Magnus (Pompey), from the First Triumverate. The third member of that informal group was Marcus Licinius Crassus, the Bill Gates or Warren Buffett of his day. No one in Rome was richer. 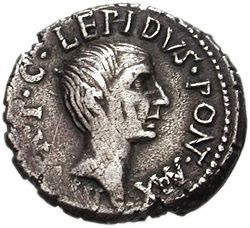 Unhappily for Crassus, and for Rome, all his wealth didn't make him a great general, and he came to a bad end against the Parthians at Carrhae. That was the defeat that Caesar was planning to avenge when he was permanently sidetracked by a fatal bout of stabbing pains on March 15, 44 B.C. Anyway, it occurred to me that Crassus would be less obscure to the modern blog reader than Marcus Aemilius Lepidus, although you may be saying to yourself about now that this is a distinction without a great difference. And who were those other two members of the Second Triumverate? Well, perhaps linking three things this random in a comment may seem too difficult... so we'll offer a second contest letting you name the Triumvirs. Huge, gigantic hint: In the epic motion picture, wherein Elizabeth Taylor made a complete asp of herself, one was played by Richard Burton... and the other was played by Roddy McDowall. Seriously.